A number of people have asked me how to enable the old Run dialog that existed on every other version of Windows until Vista, and is still gone in Windows 7. One of the nice features of the old Run dialog was that it saved the history of what you had typed in. We should note first that you can always get to the run dialog by just hitting Win + R on the keyboard, which is the simplest way to do so, and would probably be worth getting used to. 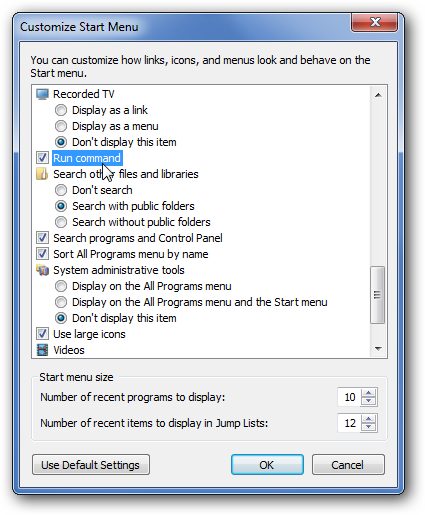 Otherwise, you can re-enable the run dialog by right-clicking on the Start Button, selecting Properties, and then clicking Customize on the ensuing dialog window. Check the “Run command” checkbox in the list, and you should now be in business:. Note the addition of the Run… button.